There are often a lot of details to attend to following a DOT crash. Use the following checklist as a starting point in your post-crash activities. ☐ If your driver was injured, and if appropriate, reach out to the driver’s family to offer any assistance and reassurance that may be needed. ☐ Conduct any needed post-accident drug and alcohol testing on your driver, within the 8- and 32-hour deadlines under §382.303. ☐ Contact your insurance agency. It can normally handle any needed on-scene investigation for you and your attorney (if applicable), either with its own people or a third-party adjuster. ☐ Consider having an attorney manage the investigation for you if you have concerns that the accident may lead to liability or an investigation. By doing so, everything will be properly preserved and the investigation can be protected under attorney work product, meaning that you and your attorney will retain control of the information. ☐ The driver’s files (driver qualification and drug and alcohol testing) as they existed on the day of the crash. ☐ The vehicle files for all equipment that was involved as they existed on the day of the crash. ☐ The driver’s activities for roughly the last 30 days (or more), including shipment paperwork, dispatch records, logs, payroll information, and anything else you can think of that you create internally. If you are coordinating with an attorney, he or she may have additional requests. ☐ If there’s an extensive investigation by law enforcement, reach out to them and provide your company contact information to the investigating officer. ☐ Enter the accident on your accident register in accordance with §390.15. ☐ Have an independent inspection. Many times, insurance companies have people who can do this. 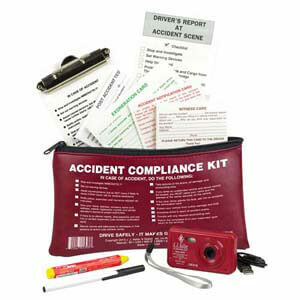 J. J. Keller's Accident Compliance Kit in Vinyl Pouch w/ Digital Camera helps drivers collect, organize and report vehicle accident information.